Your place at the lake for all Seasons! Enjoy our Winters, Summer, Spring and Fall in Sandpoint. Sleeps Cabin is six cabins built on Lakeshore Drive seventy years ago by Wm F. and Frances Hamilton Sleep. The six historic cabins are a community treasure and landmark on the lake. We have waterfront cabins for any type of accommodation request. 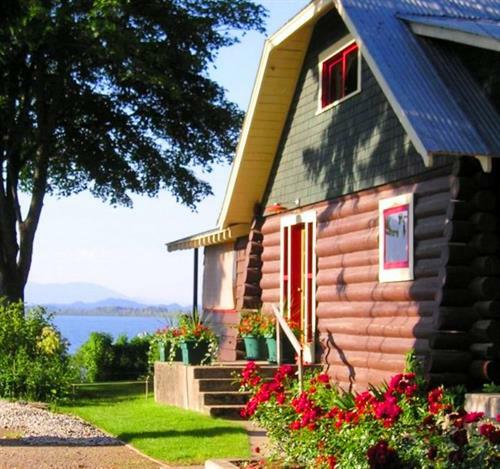 The location, the accommodations and the hospitality make Sleep's Cabins your best choice for your vacation in Sandpoint. The town of Sandpoint is straight across the lake, a five minute drive or a pleasant two mile walk on the pedestrian bridge. Sandpoint, Idaho is known for it's beautiful four seasons, arts, culture, entertainment and unforgettable scenic mountains and lakes. Lake Pend Oreille is truly the crown jewel of Idaho and perfect for any vacation. Fishing, swimming, boat charters, hiking, biking, water skiing, boat rentals, and just about anything fun in the outdoors is here in Sandpoint, Idaho. See our visitor info page for information about Sandpoint. We look forward to making your stay in North Idaho be the best that it can be. We know you'll enjoy the beautiful scenery and array of outdoor activities.